WHY USED INSTEAD OF NEW? SCHNELL offers a few machine models at a very competitive fixed price. 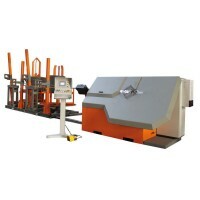 Such as a stirrup automatic bendingmachine, double bending machine and cutting machine. These machines are delivered in a fixed standard version with which every reinforcement center or concrete factory can improve production. Why invest in a used machine if a new machine can be purchased for almost or near the same money. Direction of rotation of bending head ONLY clockwise. Single wire from Ø6 to Ø12mm. Double wire from Ø6 to Ø8mm. Transport speed 72m / min. Independent diameter adjustment for double wire. 8 inch touch screen, prepared for network or barcode scanner. Electrical SERVO drive motor for transport and bending. The APPS (Advanced Picking Packing System) can also be connected to the machine. 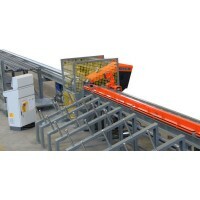 •	Roller conveyor with driven, 800mm wide, rubber-coated rollers. •	Length roller conveyor 12000mm. 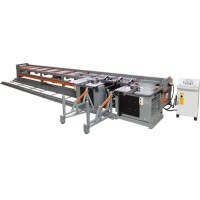 •	Two bending units, one fixed and one movable on rails. •	Bars lift in and ejection units. •	Side-line bundle / bars input. •	8 inch touch screen, prepared with USB, network or barcode scanner. •	Maximum bending capacity: 1x Ø32mm, 2x Ø25mm, 4x Ø20mm, 5x Ø16mm. •	Bending rollers: 50, 80, 100, 125, 160, 200mm. Roller conveyor with driven, 150mm wide, rubber-coated rollers. Stock stand, for 3000kg bundles. Shear C4, 5 bars of Ø 16 mm, 4 bars of Ø 20 mm, 2 bars of Ø 25 mm, 1 bars of Ø 32 mm. Computer controlled mobile length stop. 8 inch touch screen, prepared with USB, network or barcode scanner.